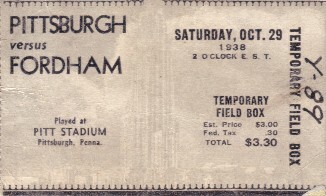 Original authentic ticket stub from the Oct. 29, 1938 Fordham at Pittsburgh game featuring 5 of the 7 remaining legendary Seven Blocks of Granite that the Fordham defensive line was nicknamed on one side of the ball, and Pitt's All-America running back Marshall Goldberg on the other. Fordham and Pitt had posted three consecutive scoreless ties in the series between the two squads, including the previous season's game (which is now regarded as the greatest scoreless tie in college football history). In this game Fordham led 7-3 at the end of the third quarter but lost 24 to 13 as Pitt mounted a furious comeback. At the end of the season Goldberg finished 2nd in the Heisman voting. Stub has moderate flaws and wear including several creases. Back has light paste residue on both ends . Y-89 is written on the front noting the seat location; K.K. is written very small on the back. How many fans bothered to save their stubs?